The Tigers celebrate a goal during their game at Cornell last year. RIT hosts Cornell Oct. 27. 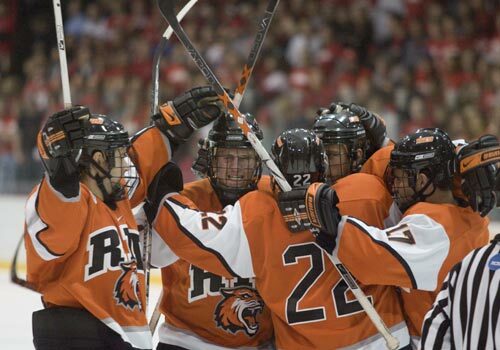 RIT men’s hockey will take on some big-time competition—in what RIT athletic officials hope is a big-time atmosphere—when the Tigers invade Blue Cross Arena later this month. The Tigers host Division I hockey power Cornell University at 7:05 p.m. Oct. 27 at the downtown arena, in what is expected to be a matchup between two of the country’s top teams. “This is a great step forward for our program,” says RIT coach Wayne Wilson. “We leave the friendly confines of the Ritter Arena to play in a much bigger place. It’s a great opportunity for our program, and we hope our students and the community support us and fill the Blue Cross Arena.” That support is already being generated. The Student Athlete Advisory Committee, in conjunction with RIT’s Student Government and Office of Alumni Relations, is hosting a pep rally the night before the game to ignite excitement. “The pep rally is going to be a celebration of men’s hockey,” says Anna Kolnik, a senior who is one of the pep rally’s organizers. “We wanted to do something big. It’s a huge honor to play at the Blue Cross Arena.” The pep rally will begin at 6:30 p.m. in Clark Gymnasium. Wilson will address the crowd and the entire team will be present. RIT’s Pep Band will perform and the “Corner Crew,” the Tigers’ boisterous fan group, has received a special invitation to attend the pep rally. “This is really going to be a great RIT community event,” says Kolnik, who anticipates somewhere between 300 and 500 people to be in attendance. “We feel it’s a great way for the RIT community to connect with the hockey team.” Kolnik says there will be two buses available to transport students to and from the next day’s game. She hopes a large contingent of the RIT community turns out at Blue Cross Arena to support the Tigers, joining others from the Rochester community and the Cornell fan base to pack the arena. Blue Cross Arena can accommodate more than 12,000 spectators. If the previous two contests between the two schools are any indication, the crowd will be treated to a close game. The underdog Tigers played nationally-ranked Cornell tight during both matchups in Ithaca, with the Big Red defeating RIT by scores of 5-3 and 3-1. This year’s game marks the first time the Big Red have played the Tigers in Rochester.